This is Frisco Station's first office building to start construction. The partnership plans to start building apartments, a hotel hub and entertainment destination, and a large 25-acre park and trail system in the near future. It's those walkable amenities setting Frisco Station apart from other suburban office buildings, Mike Berry, president of Hillwood, told the Dallas Business Journal. "If you look at the overall market there in the Legacy and Frisco area; it's pretty tight," Berry told me. "With the job velocity we see in the next two years, we think it will continue to drive demand for office space." The 240-acre Frisco Station is planning for a 20-story "urban living" building at Gaylord and John Hickman parkways. The proposed high-rise would be part of a retail, restaurant, hotel and entertainment complex that Frisco Station developers are calling The Hub. "We have had a lot of interest in this type of product so we are trying to keep all of our options open," said Trey Sibley, general manager of The Rudman Partnership, one of the partners in Frisco Station. Here's what was with the article. This Skyhouse looks glassier than the other 2 here. The article lists no construction/completion timeline. Both previously mentioned without the all of the specifics available now - in Tnexster's post just upthread a little bit. Russell Laughlin @HillwoodDevelop at #NTTS2018 says test flights of #UberElevate will begin in #DFW in 2020. DFW Airport to Frisco Station. Construction has started on a Canopy by Hilton hotel at Frisco Station. This will be the second Canopy property in TX after the one in the Cityplace/West Village part of Uptown. It will have 150 rooms and be 7 stories tall. Lewisville-based NewcrestImage will be the developer and management company. The Frisco Canopy is set for completion late next year. Nanoo nanoo, I have travelled back in time from 20 years in the future to express a mocking gesture at Frisco for their foolishness at thinking any technology can be "future-proof". I must return now. Praise Emperor Bieber. Is the Frisco Skyhouse still a thing? Didn't see it mentioned and its been quiet for a long time. Also checked the developer web page and didn't see any news about it. Tnexster wrote: Is the Frisco Skyhouse still a thing? Didn't see it mentioned and its been quiet for a long time. Also checked the developer web page and didn't see any news about it. The Frisco Skyhouse been under construction for a month now. They are on the fifth or sixth floor I believe, I drove past there yesterday. Also, the twelve cowboys way highrise which is part of the star (https://www.twelvecowboysway.com/) is also rising too, The 5 story garage pedestal is almost finished. DAFW wrote: The Frisco Skyhouse been under construction for a month now. They are on the fifth or sixth floor I believe, I drove past there yesterday. Wow, thank you for the update. That camera view is funny, seeing a high rise coming out of a pasture. Nice pic, looks a bit lonely out there but maybe it will fill in around it soon enough. Tnexster wrote: Nice pic, looks a bit lonely out there but maybe it will fill in around it soon enough. With the rate things are going up out there, I bet it won't be too long before there's a boatload of other things around it. Yeah QT's, Walmarts, drive-thru strbucks etc. 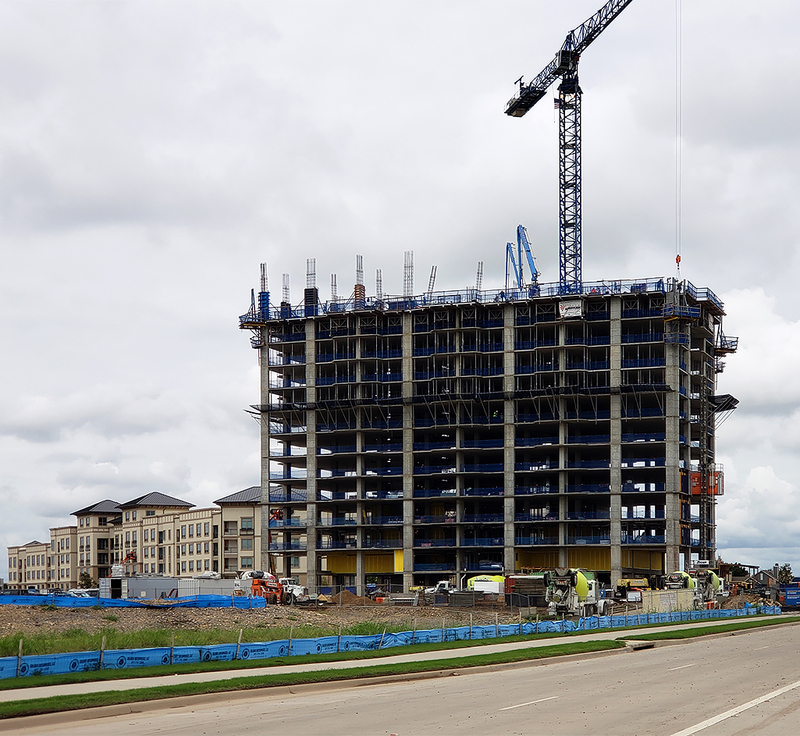 The AC Hotel and Residence Inn properties at the Frisco Station development are expected to be complete and open in June. Be nice to see a better picture of the entire area to how Frisco looks with all the new development in one shot. This DMN article says 'summer opening' but some sources are saying that it will be later in the year before all the hotels in 'The Hub' section of Frisco Station open. A combo Residence Inn/AC Hotel, a Canopy by Hilton, and a Hyatt Place are the 4 hotels being built in this section of the development. Strangely enough, all 4 hotels will have exactly 150 rooms each. All are being developed by Lewisville-based NewcrestImage, a company with several area hotels managed or being built (including the AC/Residence combo on Commerce and the next-door Hampton at Commerce/Ervay in DTD) in the area and other parts of Texas.